Soundbrenner Pulse Review: Metronome Of The Future? When I started playing drums, metronomes used to be really clunky. My first metronome looked like the most boring thing my childish eyes had ever gazed at. But the times, oh, they are a-changin’ – and Soundbrenner is on a mission to revolutionize the metronome game. I know: that musicians are better able to play in time when the pulse of a beat is signalled to them by means of vibration – not sound. Sounds convincing, right? But does it prove itself true in reality as well? I’ll give you my view in this Soundbrenner Pulse review. The Soundbrenner Pulse comes in a nicely-made box which reminded me of an iPhone box (that’s a good thing). So far so good, but this wouldn’t be a Soundbrenner Pulse review if I didn’t tell you how the metronome actually worked, right? In order to do that, I’ll take you through “The Metronome” app and then through the actual vibrating metronome. 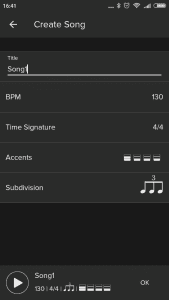 The Soundbrenner app – called “The Metronome” – is the piece of software that you use to control your Soundbrenner Pulse, and it is freely available in Google Play and Apple App store. Why is the app free? 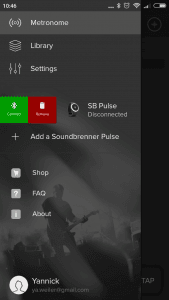 Because you can use the app without owning the Soundbrenner Pulse. 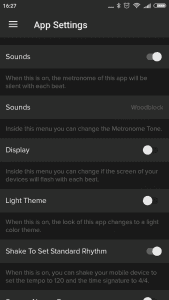 If you download it, you will have a standalone metronome app – and a good one too. But of course you’d miss out on the revolutionary part of the Soundbrenner Pulse (the vibrations). You immediately see the BPM (beats per minute) setting which is arguably the most important part in a metronome. In the photo above, you can see that my time signature is set to 4/4 and quarter notes. The green symbol at the top signals that my Soundbrenner Pulse is connected via Bluetooth and that the battery is at about 60%. This is all there is to this screen and I love it. It’s simple and easy to understand. I’ve tried metronomes that I couldn’t start using without reading the manual first. You can also see the neat little option to “shake to set standard rhythm” in which shaking the phone would cause the app to give you a 4/4 beat at 120 beats per minute. This means that you are creating a new pulse to play to in this view. There is also a “load” view next to it, and this is where preset songs and setlists come into play. This is perfect if your band, orchestra, etc. is relying on a click on stage, especially if you’re the person responsible for providing that click. One caveat: you can’t create multiple pulses and have them automatically change after a certain time. This would be needed for songs that change their pulse within themselves, but this just isn’t possible with the Soundbrenner app. That’s it for the app settings, so let’s look at the wearable Soundbrenner Pulse itself. 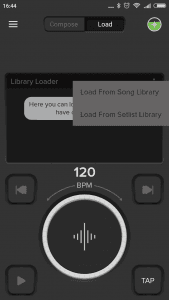 As I said, you can use The Metronome app without the Pulse, but you can just as well use the Pulse without the app. In that case, you’d turn the Soundbrenner Pulse on by turning the outer wheel and tapping the middle with 2 fingers. 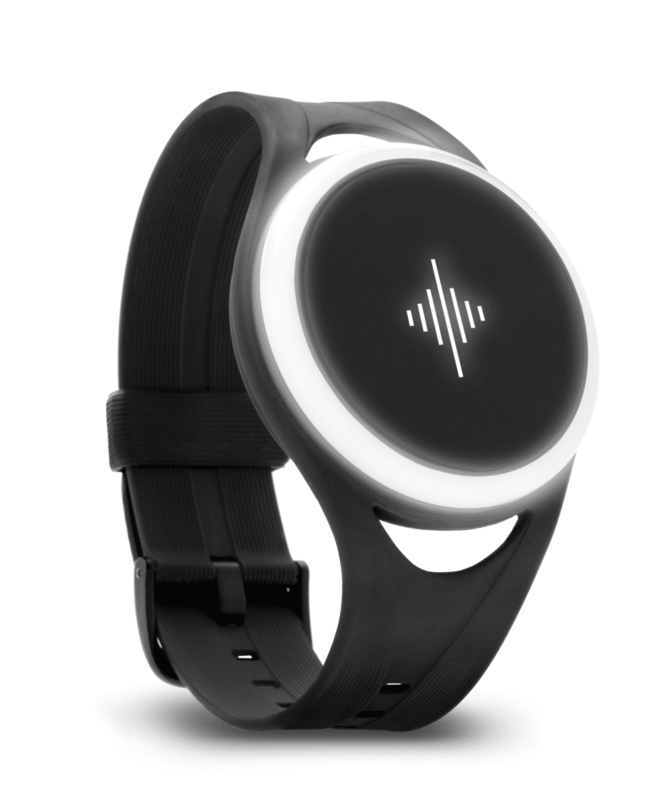 The wearable metronome will respond with a first vibration and some nice-looking light. Tap the metronome at your tempo of choice and after three taps the Soundbrenner Pulse will automatically start to vibrate. The longer you tap, the more accurate the tempo will be. Each vibration will be accompanied by a flash of white light. You can change this, but only if you use the app (more in a second). 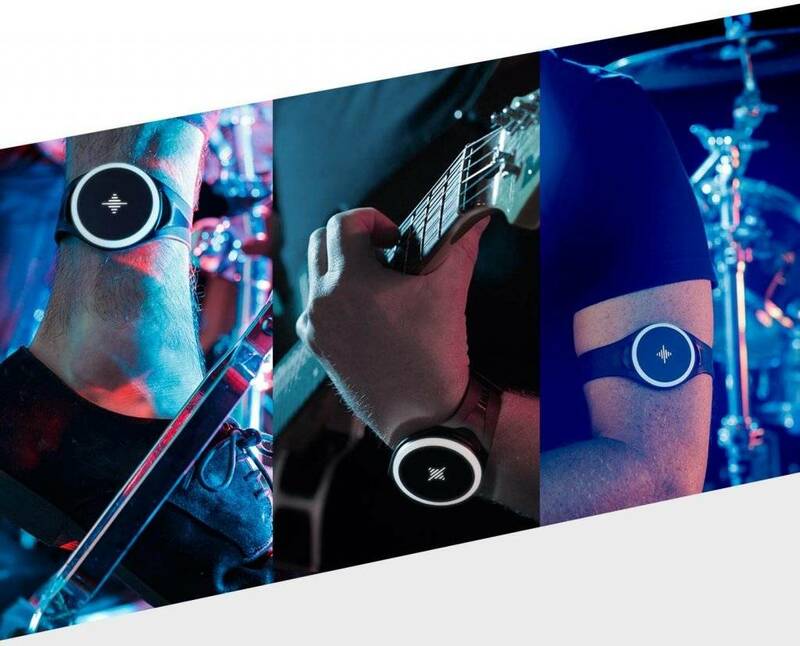 Without the app, you’d only have to strap the Pulse onto your body in one of the three recommended places – wrist, upper arm, or ankle – and off you go with your playing or practicing. 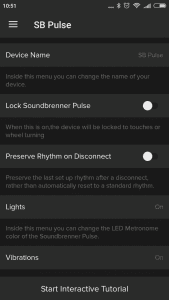 But personally, the fun really begins once you connect the Soundbrenner Pulse to The Metronome app, because once you do, you can access the wearable’s settings. 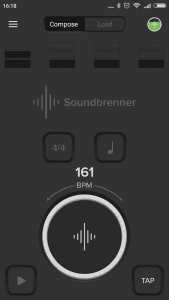 …or you can use “locking the Soundbrenner Pulse” to prevent changes when there are accidental touches on the app or an unintended turning of the wheel (while rocking out on your drum set for instance). Heck, you can even “preserve the rhythm on disconnect” in case there should be any technical hiccup on stage. But I think the most useful option is the one to change the strength and duration of each vibration. 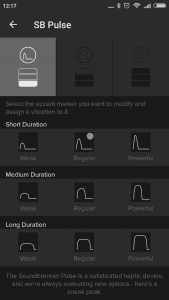 For vibration is the heart of the Soundbrenner Pulse technology and I have found it to work really, really well – if you play around with those settings. I say this because everyone plays a different style of music in a different tempo and with a different intensity in terms of body movement. I, for instance, play rock one day and jazz another, and I’ve found that in a slow jazz tune, the long vibrations at weak intensity help me a lot, but would be much too blurry when blasting out a punk beat at 190 bpm. 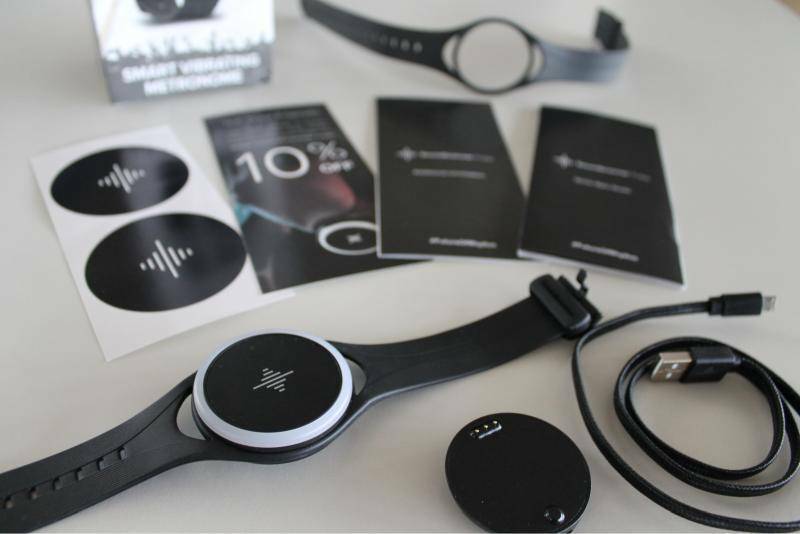 With the Soundbrenner Pulse you can customize the way the pulse is delivered to you. It can be short and punchy or more drawn-out and subtle. This can help you feel yourself into the groove – especially at slow tempos. I know of no auditory metronome that enables you to modify the length of the “beep”. Receiving the pulse in the form of vibration adds another layer of feeling to your rhythmicality. You’re now presented with a pulse as a visual, auditory AND haptic phenomenon – and I’ve found that this has given me a better feeling for whether I’m playing in time or not (even when not wearing the Pulse). Slender interface in the app that most people will be able to navigate intuitively. 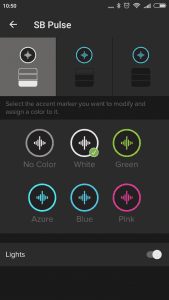 And even if not, the Soundbrenner app has an interactive tutorial on board. The Soundbrenner Pulse strapped on looks really cool, so much so that I now wear it in my free time here and there. Plus: I’ve been asked about the Pulse by virtually every musician that I rehearsed it while using it. A real attention grabber. The straps are completely sweat-proof and robust, so they can easily take your sweating and moving around on stage. Like with everything else that’s new, the Soundbrenner Pulse comes with a learning curve. You can’t expect to benefit from what I’ve said under “2” above the first day. Truth be told, the vibration will most likely confuse you more than help you groove for the first few minutes (except you’re starting out fresh). So you need to spend a bit of time (took me about half an hour) getting used to feeling and playing along to those vibrations. I’ve said that the Soundbrenner Pulse will benefit any musician who wants to strengthen their feel for playing in time or grooving. This strap is longer, so you can use it around the center of your torso (chest, collarbone, shoulder, thigh) which remains relatively still even while playing the drums. I’m now wearing the Pulse around my chest most of the time, and I’ve also found this to increase the intensity with which I feel the pulse a good bit. Does the Soundbrenner Pulse make any audible sound when vibrating? Not really. Once you’ve switched off the sound via the app, the vibration will only make the same slight noise that your smartphone makes when it is set to vibration-only. Can you turn off the lights on the wearable metronome? How easily does the outer ring turn for adjusting the beat? Does it change if bumped? I’m a runner needing a consistent 180 cadence. (Good point: the Soundbrenner Pulse works for runners too!) The outer ring adjusts somewhat like the outer ring of a watch – easily that is. And you can completely lock the wearable from touches and turning the wheel in the app settings. 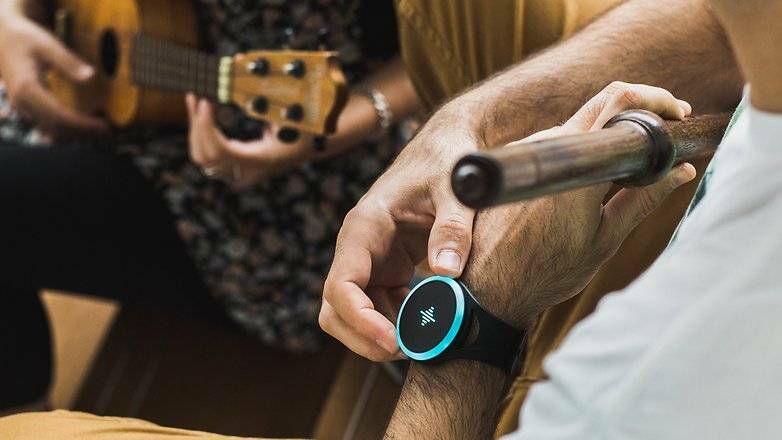 I was fascinated by the idea of the team at Soundbrenner to make a metronome wearable and add vibration to really get musicians into feeling the rhythm. At the same time, I was skeptical about the execution of that idea. But I have to say I’m impressed! The design of both the wearable and the app is exciting, the user interface simple with tons of customization options underneath – and the vibration really works (for me). My only minus are the wearing positions for drummers – but with the body strap starting to ship on July 18th that point will be eradicated. I hope this Soundbrenner Pulse review was useful to you. Thanks for reading! Do you own a Soundbrenner Pulse and have a viewpoint to share? Or do you have question left open? I’d love to hear from you in the comments below! Thanks for your review! Is it possible to play in irregular for example 11/8 or 9/11 ? All irregular metres that you can think of can be set inside the Soundbrenner App – among them 11/8 too. I’m not sure what you mean by 9/11 though as 11th notes don’t exist. Is Soundbrenner working on compatibility with Windows Based DAW’s? Pro-Tools, Sonar? Thanks for your question! Pro-Tools works with Soundbrenner; I’m unsure about Sonar. 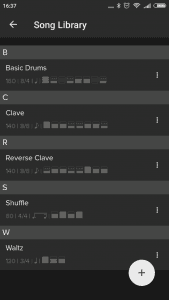 Another one that works with Soundbrenner is Ableton Live. Thanks for your response. My question was: Currently The App and Pulse are compatible with Mac based DAW’s. Is Soundbrenner working on compatibility with Windows based systems? Sonar, Pro-tools? Soundbrenner doesn’t run on Windows DAWs yet, but there seems to be a workaround via Bluetooth or WLAN. I haven’t tested it, but would be interested to know if it works. If you try it, pleaes let me know! I have a stammer which becomes worse when stress. As of which I was trained to control my speech with a metronome but you cannot carry that around with you nowadays. As my stammer has gotten worse I wish to ask would Soundbrenner be of any benefit to me? Thanks for sharing this. Since I don’t know how exactly you use the metronome – I can only tell you that you can carry the Soundbrenner around for sure (under your sleeve or attached to your leg so no one will see it). My bad I should have gone into more detail. I was trained to keep my speech in time with the ticking. And you want to use Soundbrenner’s vibration in place of the ticking? That should work. I I was hoping this would also work as a watch. So I could hadvw the best of both worlds. Dow’s it function in that way? Thanks for your question. 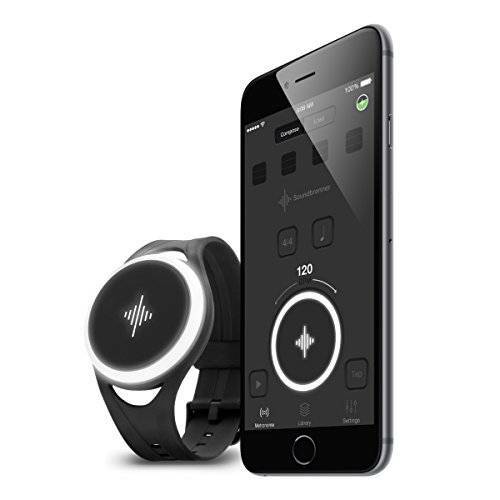 Unfortunately, the Soundbrenner Pulse does not work as a watch – only as a metronome.